I began to photograph the Utah political process (1974 to 1981), as the way of learning black & white photography. Along this path I was to see many things, centered mainly around Utah's citizen legislature. 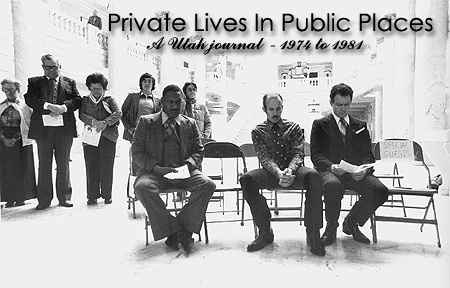 This page contains links to a group of 80 photographs, that I have gathered together under the title of Private Lives in Public Places, a Utah Journal. This collection of photographs was slated for an atrium exhibit during the fall of 1982 at the Salt Lake Art Center (presently named: Utah Museum of Contemporary Art).